Chase & Status have just finished their (magnificent) Glastonbury performance that was also shown live across the UK on BBC3 TV. Chase & Status were not live tweeting or posting to social media, but the Chase & Status website was geared up to showcase and amplify real time commentary around the Chase & Status Glastonbury set. 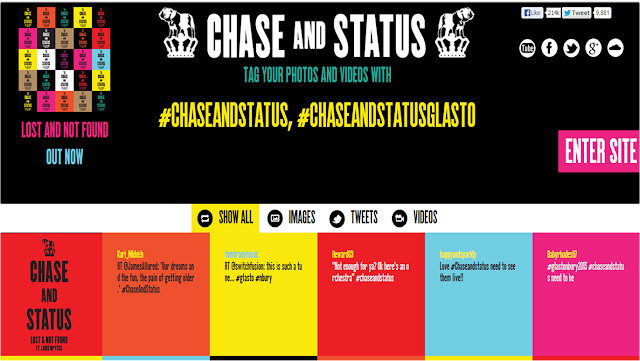 The Chase & Status official website is fronted with a page that simply states 'tag your photos with #chaseandstatus, #chaseandstatusglasto.' This encourages conversation around the performance, but more importantly hubs and amplifies the commentary around the Chase & Status live set / live TV broadcast - and with hashtags now being used on Twitter, Facebook, Instagram, G+ and more, this simple call to action can now work across many platforms. In the absence of officially created social content, Chase & Status harness fan content to drive comment / amplify related conversations, whilst BBC Three have been using Twitter throughout Glastonbury to stimulate conversation and promote their coverage of the weekend. Both are interesting examples highlighting how real time social TV buzz can be tapped into around a great performance!